This research analyzes the nature of bus transit pollution. This blog post is part of EMBARQ’s sustainable urban transport fuel and vehicle program made possible by generous funding from FedEx. EMBARQ, the producer of this blog, has recently released a working paper “Exhaust Emissions of Transit Buses”. This report is the first in a series that will compare bus lifecycle emissions and costs specifically in Mexico, Brazil and India. Erin Cooper is a Research Analyst with EMBARQ’s Research and Practice Program, where she works on projecting the impacts of EMBARQ’s various transportation and development projects. We sat down with her to discuss the insights of her research. This first report looks at bus exhaust emissions. What specific emissions/pollutants did you consider? Why? This research uses a collection of data from in-use transit bus testing. Transit bus testing tends to look at the regulated pollutants which cause local air pollution and contribute to human health problems: particulate matter, nitrogen oxides, carbon monoxide, and hydro-carbons. Researchers may include tests for other pollutants such as carbon dioxide or volatile organic compounds. We review this data with respect to different fuels and exhaust after treatment technologies. We are also looking at bus exhaust emissions with respect to a few variables: emissions standards, mileage of the bus, altitude of test location, driving pattern (does driving resemble an urban or suburban environment), and field testing versus lab testing. This allows us to see how fuels and emissions may change in different situations, which helps to make the information more relevant for specific agencies. What are the key results of this research? This report shows that exhaust after-treatment technologies and diesel quality, improvements to which are driven by regulations, are more important factors in reducing emissions than changing fuel type alone. There are also trade-offs between different fuel and technology combinations with regards to reducing global warming pollutants or reducing pollutants that are harmful to human health. 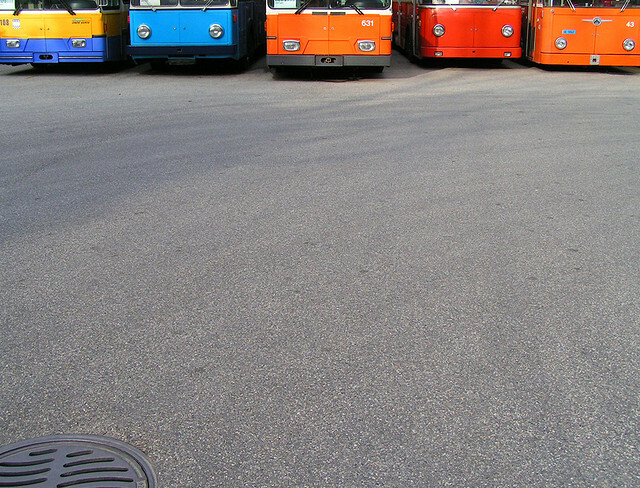 How valuable are emissions standards to reducing urban bus emissions? Exhaust after-treatment technologies are needed to meet emissions standards. If buses are regularly tested, emissions standards are very effective in reducing the regulated emissions. However, because CO2 has not previously been regulated, the current emissions standards can have either a positive or negative impact on the amount of CO2 emitted. The sulfur content of diesel also has an impact on the ability of buses to meet proscribed emissions standards. How does the sulfur content of fuel impact emissions? The sulfur content of diesel fuel contributes to air pollution in the form of sulfur dioxide, and it also contributes to the formation of particulates which can reduce the effectiveness of emissions reduction technologies. Ultra low sulfur diesel (roughly 10 to 15 ppm) is what is used in the US and Europe. Many developing countries can have diesel sulfur content values higher than 500 parts per million. Below this value, oxidation catalysts can be used which reduce emissions. Many countries, including Brazil, Mexico and India, are working to reduce the sulfur content of fuel below 500 ppm and to 50 ppm in metro areas. Below 50 ppm, diesel particulate filters can be used. Which fuels perform best in terms of public health impact? Though there are health impacts resulting from many emissions types, particulate matter is often used as an indicator of impacts because there is a quantifiable impact between increases in particulate matter and mortality. Natural gas fuels are naturally low in particulate matter. Using exhaust after-treatment technologies on diesel and biodiesel can also bring particulate matter down to a level comparable to natural gas. Why aren’t CO2 emissions regulated? There is new legislation in the US for heavy-duty vehicles which will result in CO2 emissions reductions in 2014. Because the regulations are new, emissions standards are not considered in many past bus tests, though bus emissions tests often captured values for CO2 emissions which are included in this report. Hasn’t a lot of data about urban bus emissions already been published? There are many emissions tests for vehicles of many fuel types, but much of this testing has taken place in the US or Europe. This test data is not directly relevant to EMBARQ’s target countries, Mexico, Brazil, and India where different vehicle technologies and fuel qualities are prevalent. Much of the US and European data must be analyzed to understand how it relates to developing countries. Also, there are many reports that compare only one or two fuel types – often CNG and Diesel but EMBARQ was interested in a broader comprehensive analysis. The tests are also performed in locations that may not represent the countries where we work. Our approach was to combine as much data as possible from different reports, and looking at different fuels, to create a broader picture of the expected range of emissions resulting from different fuels and technologies. Why isn’t there a greater market share of these alternative fuels already? Diesel is an important heavy duty vehicle fuel because it provides high energy content. This is why it is used and why bus manufacturers have worked to reduce harmful emissions from diesel engines for decades while maintaining it as an energy source. Fuels that have been less prominently used until now, such as CNG, may have lower emissions, but generally have lower energy content as well. They have also not benefited from as much effort to reduce emissions and improve fuel efficiency as has been done with diesel technology. However, the EPA 2010 emissions standards will hold all fuels to a common standard. What can the results of this research be used for? The results of the combustion emissions working paper can be used to assess different fuels, and which factors might be involved in choosing different fuels or technologies. We would also like to use this paper to start a discussion on emissions and true comparisons between fuels and help us to identify further data sources of exhaust emissions. What are the next steps of the research? We are continuing to search for bus emissions testing data to improve the accuracy of our report. Additionally, we want to tie the results as directly as possible to public health impacts. The goal of the full program of research is to look at lifecycle costs and lifecycle emissions to understand which buses are the better options for different locations. Lifecycle cost looks at the full cost of the bus including purchase, operation, and maintenance. Lifecycle emissions is an important concept to consider as most regulations up until the present have focused on reducing emissions that cause air pollution. This portion of the research should be available early next year.